Part of the IT Crowd? Do you work in IT – as in, information technology? Could you put together a team made up entirely of colleagues who also work in IT? Well then, you could be in line to win a pretty generous cash prize. 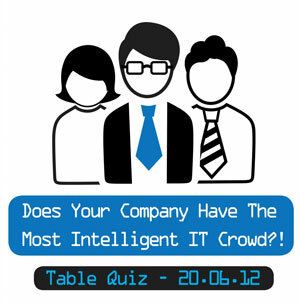 CPL Recruitment are running a table quiz in Dublin on June 20th in which teams must be made up of four people from the same company who all work in an IT role. Why jump through such hoops? Well, the first prize is a massive €4,000. That’s right – €1,000 per team member!